Download Chapter 1 - Am I Hungry?Am I Hungry? 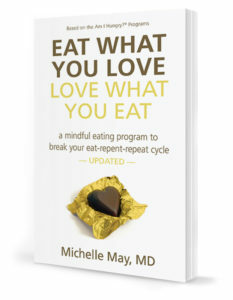 If you want to purchase a copy of Eat What You Love, Love What You Eat, click here. Do you regularly deprive yourself, succumb to temptation, feel guilty, and then start the process all over again? Are you finally ready to get out of the food-focused, diet-driven downward spiral that keeps you stuck in your eat-repent-repeat cycle? If so, Eat What You Love, Love What You Eat will guide you to rediscover the expert in you so you can live the big, vibrant life you crave. Download chapter one above free or purchase Eat What You Love, Love What You Eat here. 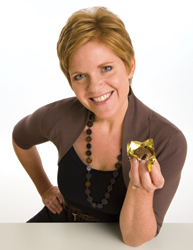 Michelle May, M.D., is a recovered yo-yo dieter and the founder of the award-winning Am I Hungry? Mindful Eating Programs and Training. Hundreds of health and wellness professionals have been trained to offer Am I Hungry? Mindful Eating Programs in their communities, companies, and practices worldwide.